Announcement Thank you, come again. A Custom ordered bracelet for as a Father's gift to his daughter. chevron patterned copper on brass cuff. chain mail patterns I have made. Everyone has a story but not everyone has an interesting story. My story is the latter and as such I will not bore you with it. The name of my shop is IMMetal and it is pronounced just the way it is written all together. Similar to Immortal which is where the idea came from. Long story short, My mother and I were talking about some of the ideas I was working on at the time. I was working on etching pictures into copper and bronze and I said to her that the picture would be immortalized and my mother said "....or immetalized." Of course I liked the sound of that at first but it seemed a bit too long and less likely that people might remember when trying to find online. I kept the root of the word though and it changed from I M Metal to I. M. Metal and finally just settling on IMMetal Designer Jewelry. There are other companies that use similar words such as a company in Croatia called IM Metal and they manufacture guns but I only found out about it after purchasing IMMETAL.com. Still though, I like the way it sounded and try to keep it set apart by including what IMMetal is about and that is designing jewelry for everyday wear. I have recently made earring displays in Brass and copper spoons, as well as, Copper roses and Calla Lillies. Soon I will be working with precious metals, such as, Silver, Sterling Silver and Gold. I like the idea of designing and creating in metal, which is part of the company name and identity. 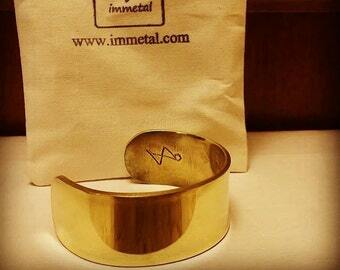 Thank you for shopping with IMMetal Designer Jewelry. I get a lot of inspiration from my wife, family and life. I have people in mind when I am designing jewelry. I view each piece as unique and different.